The night sky is often full of migratory animals, from large geese down to tiny fruit flies. But there’s more than just migration happening up there. Since most of those migrants are fueling their journeys with fat, they are also an excellent dinner for any predator who can find and catch them. However, unlike the well-studied ground-level interactions of lions or crocodiles and migratory herds in Africa for example, this aerial interaction is very difficult for us to study. 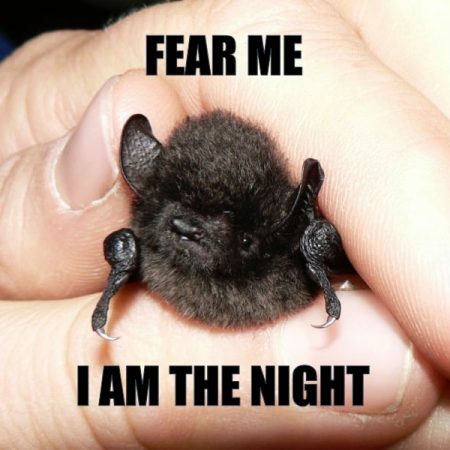 Of course, we know that bats eat moths, and we know quite a bit about bats catching flying insects. But few bats appear to routinely forage hundreds of feet high in the powerful winds migrants are using for transport. We know of some examples: bats eating migratory songbirds. 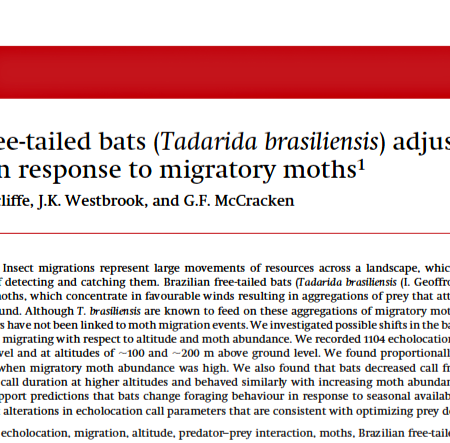 And in my own research, Brazilian free-tailed bats consumed many species of migratory moth in autumn and foraged higher when they were eating more migratory moth species. Their larger European cousin also eats many migratory moths, and in Asia their cousin the wrinkle-lipped bat takes advantage of migratory planthoppers. 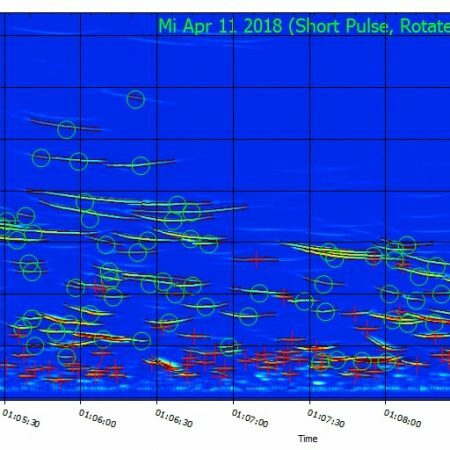 How do these bats know when and where to find their migratory prey? How do they locate and catch individual prey items? 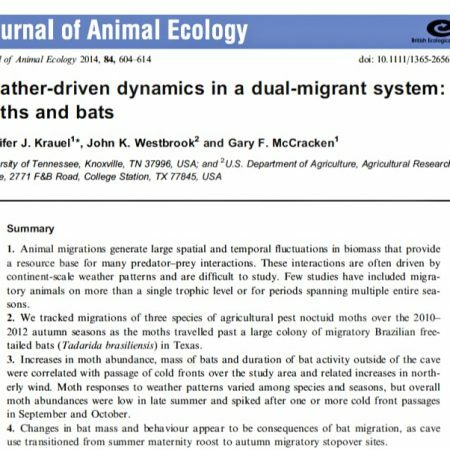 If the bats themselves are migratory, do they opportunistically forage en route? 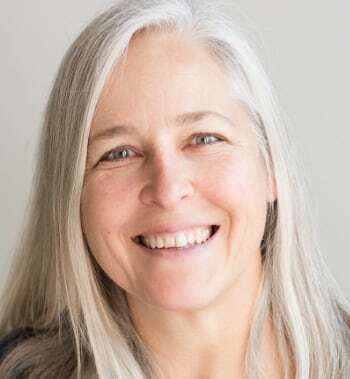 How important are migratory insects as prey, seasonally and overall, and what would be the effect of a disruption in migratory insect movement? 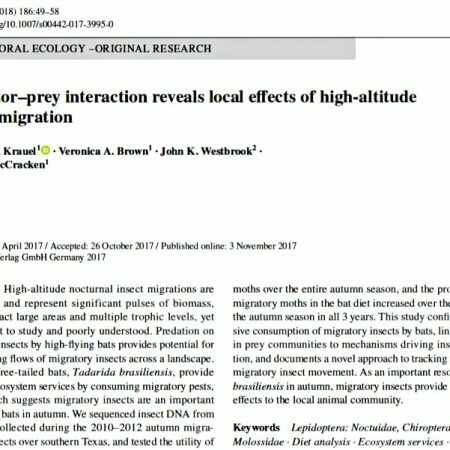 Have interactions between migratory predators and migratory prey evolved to take advantage of the cyclical and temporal nature of migration?